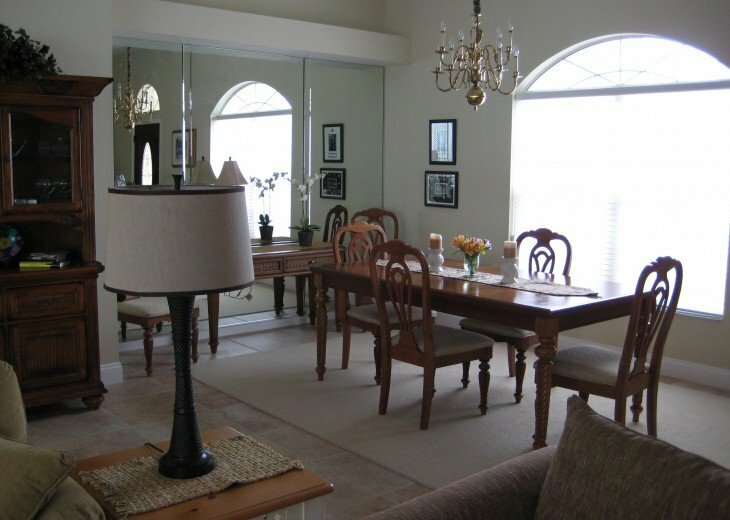 A beautiful private 3 bedroom, 2 bathroom home for your vacation or getaway. Call if questions. This beautiful, bright and airy home is tastefully furnished and decorated, has a 55" Ultra HD 4K TV, a 42" HD TV and a 32" HD TV and Netflix. 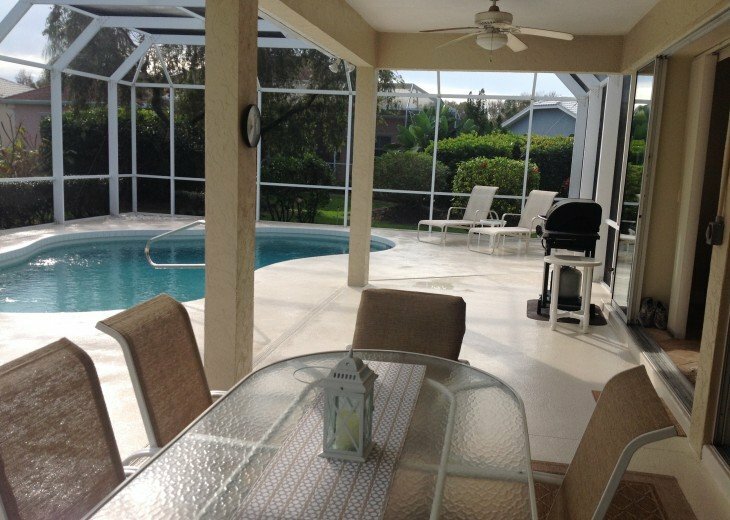 It offers a large private, heated pool enclosed in a very large lanai overlooking the 12th fairway of Tara Golf & Country Club. 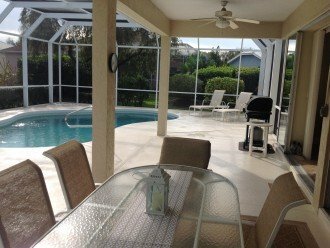 The lanai & pool get sunshine all day long and you can also seek the shaded part of the lanai for your protection. Recently renovated and redecorated, this home has all new appliances to enhance your stay. We have a double car garage, and room to sleep 6 people comfortably. Use our office with desk, office chair, printer-scanner-copier, high speed internet, WiFi and free long distance calling. The master bedroom has ample dressers, a 42" HD TV, Blu-ray DVD, two walk-in closets and a very comfortable king size bed; the ensuite has a separate jacuzzi tub, double sinks and a very large walk-in shower. The second bedroom has a queen size bed and dresser with a large walk-in closet. The third bedroom has two single beds and dressers and a 32" HD TV and a large walk-in closet as well. The second bathroom has a walk-in shower/tub. Our dining area will seat 6-8 people comfortably. Our home has a fully equipped kitchen with new stove, new fridge, new dish washer, micro wave, and a water filtering system. It is nicely furnished with 3 flat screen HD TV's, 2 DVD's, cable TV, hi-speed internet, WiFi, free long distance calls in Continental US and to Canada, new washer, new dryer and is fully air conditioned with humidity control. We have all the dishware, cutlery, pots and pans, bedding and linens that you will need. Just come and enjoy yourselves. We are a very short walk to the Clubhouse for our state of the art fitness center, our tennis courts and our very large heated community pool with spa. All of these are available for your use. Rental cost is $875 per week (except during February and March which is $1,500 per week) plus $125 for cleaning and 12% tax. 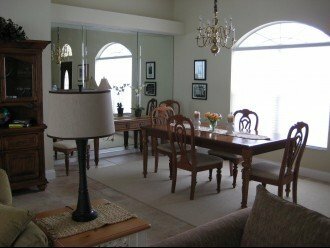 Well located for numerous beaches, four airports, 30 museums and art galleries, orchestra, ballet company, an opera company, 10 live theaters, 10 min, from shopping at The Ellenton Outlet Mall with over 100 shops and stores, excellent restaurants, numerous golf courses, 10 min. to IMG Sports Academy, 9 min. to the world class rowing center at the Nathan Benderson Park, 9 min. to University Town Center with over 100 high end shops as well as Best Buy, Super Target, the Apple Store, Macy's, Nordstrom, Gucci and many other stores. A beautiful home with a private setting. Enjoy the lovely warm pool and relax in the sun or the shade. 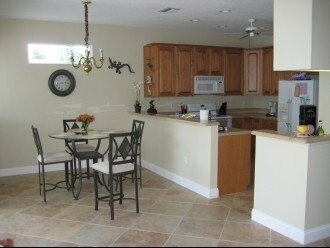 Located in a safe, friendly community consisting mainly of retired couples and young families. There are over 45 golf courses near by. Enjoy golf, tennis, fitness center, biking, fishing, boating, the theatre performances, Ringling Museum of Art, the Mote Aquarium, shopping, entertainment and the beautiful beaches of Siesta Key, Longboat Key, Anna Maria Island and Bradenton Beach. The closeness to Interstate 75 allows you to attend the Tampa Bay Rays (baseball), Tampa Bay Buccaneers (football) and the Tampa Bay Lightning (hockey). For longer stays, we can transfer our membership to the private golf course to you so that you can golf free as members during your stay. Kids will love our home due to our swimming pool, tennis courts, biking, Ringling Museum, Mote Aquarium, Big Cat Habitat, Disney World one and a half away, Busch Gardens, Myakka river State Park, Gulf Coast Sanctuary and many other activities for children. We rented in the Tara Golf & Country Club community for 8 years before we purchased our home there. We were attracted by the great golf course, friendly people, beautiful weather, convenience to shopping and entertainment and access to Interstate 75 for quick travel to many different areas and events. Within walking distance you have 2 golf courses, tennis courts, two fitness centers, fishing, boating, kayaking, 8 restaurants, Publix grocery store, Lowes, US Postal Services, Starbucks, and many more events and services. About the owner: We are a semi-retired professional couple. We love to golf and enjoy the warm Florida weather. We are also snow birds who still like to alpine ski, so we share our winters between snow country and the warmth of our Tara home. Why this property? See our reviews. Guests are very pleasantly surprised with how nice our second home is and the amenities that we have. If cancel prior to 90 days before arrival date, full refund except a $200 re-booking fee. If cancel within 90 days of arrival date, no refund unless we are able to re-book for same amount for same period. Note: to date, we have always been able to re-book upon cancellation. My wife and I truly enjoyed our stay at this beautiful home. The house was immaculate with plenty of the essentials. The pool was magnificent. The location couldn't have been any better. You are close to shopping, restaurants, beaches and sightseeing. We were there a month and the owner called several times to make sure we didn't need anything. While there we had several guests stay at various times. All were extremely impressed with the home. We would highly recommend this rental to anyone. We felt like we were at a resort. We enjoyed the area so much we have decided to look at properties for a more permanent move.